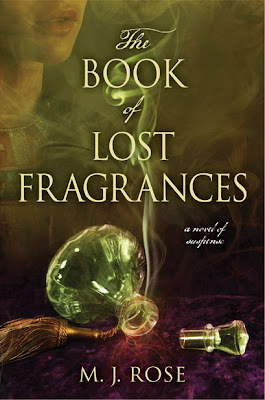 The Book of Lost Fragrances is one of those books that captivates the reader from the very first chapter. Set during modern-day Paris, Jac L'Etoile has returned to her childhood home in attempt to unravel the truth about her brothers disappearance. But soon after her arrival, she begins to discover that there is more to her family history than she ever thought possible. Haunted by fragrances long forgotten, Jac begins to see the power of scent and that her brothers belief in reincarnation might be more than a childish pursuit. As the search for her brother continues the shocking reasons behind his disappearance come to light, and if Jac doesn't solve the mystery of the House of L'Etoile soon, she just might be the next victim. Told from multiple perspectives and spanning time from Ancient Egypt, The Napoleonic Era and present day Paris and Tibet, The Book of Lost Fragrances weaves a tale that is as strong as the fragrances spoken of within the pages. M. J. Rose did a fantastic job of creating three dimensional characters with personalities that never seemed to stop evolving. There are numerous plot twists throughout the novel, so the moderate flow of the story allows the reader to easily follow along. The highlight of this novel was the authors ability to vividly portray the scents in every scene. The reader is instantly transported to the damp mysterious tunnels, the incensed chambers of Cleopatra, a neglected mausoleum and so many other locations... all through the descriptions of scents we've experienced throughout our lives. This is the fourth book in M. J. Rose's The Reincarnationist Series, but it can definitely be read as a stand alone novel. Overall this is a captivating and entertaining read, and there is no doubt that this novel will be brought to mind whenever a familiar scent is enjoyed.